HTC’s upcoming One X10 flagship smartphone that was part of rumors since this year began, has leaked in a press render that promises expansion in memory capacity. 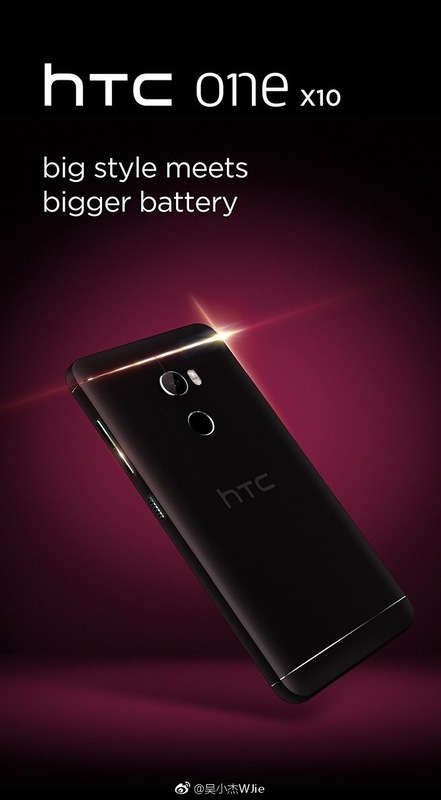 Promoted as “Big style meets bigger battery”, seems like HTC is putting effort on expanding the battery lifetime of its devices. The HTC One X10 is expected to sport a metal body design, this confirmed by earlier leaks where the handset was photographed sporting a metal unibody design, a dual LED flash assembling that of Galaxy Note series (now adapted on the Galaxy S8) and a rear-mounted fingerprint just below the cameras. According to numerous of reports, this year we won’t be seeing an X11 flagship but we may get the metallic One X10 and the other flagship, HTC U. However, there’s a long wait until the flagship reaches the western market or joins the prepaid line of Virgin Mobile phones. Specifications of the One X10 are partially known. The handset is said to be sporting a 5.5-inch FHD display, a 16MP primary camera with dual LED flash, an 8MP selfie snapper at the front. There’s a disappointment coming with the X11 substitute, the One X10 may have MediaTek Helio P10 onboard and that’s not what everyone wants. Helio P10 is one of the worst chipsets ever made by MediaTek, not much of a power coming from it. On top of the Helio P10 will be 3GB of RAM, 32GB of expandable memory, Android 7, and a starting price of around $300. The metal design and camera configurations highlight total outcome one receives from this mid-range HTC flagship phone. The new leaked photo previews the back side of the phone and unveils some rugged physical button placed below the volume buttons with some rugged design. While One X10 does not have the hardware to compare it with the currently U Ultra flagship or the upcoming HTC Ocean (rumored to be named HTC U) it may have a more stylish design and longer battery life. design wise looks like the redmi note4 from Xiaomi in Black! !